If you’re new to running, there are some things you should do before hitting the pavement. A veterinary perspective includes an additional prerequisite: having a plan for dealing with aggressive, off-leash dogs.Before we get into safety tips, let me state for the record that I am in no way defending the actions of individuals who allow their dogs to roam. Leash laws apply to everyone, regardless how well behaved we think our dogs may be. No one is special. Animals can be unpredictable, and if your dog does surprise you by causing any kind of damage, the law is not on your side.That said, accidents happen. Gates are mistakenly left open by service providers. Children and houseguests can forget to close doors. Dogs are owned by humans and humans make mistakes. Some dogs are stray, and others still are abandoned by those whom they trusted in residential neighborhoods. Many runners report being confronted by free-roaming dogs, and while most will neither attack nor bite, it’s good to have a plan for dealing with those who do.Why are runners a target?Runners who’ve had unpleasant encounters with dogs often take it personally. “I did nothing to provoke it,” one runner told me. “I love dogs. Seriously, what did I do wrong?”While we love our dogs like family, celebrate their birthdays and dress them in sweaters when it’s cold, it’s important to remember, they are animals. What’s more they are carnivores. Carnivores hunt. They take down prey.And prey runs.How will I know if a dog is dangerous?Most of the dogs who approach you on your run have neither the intent nor the desire to harm you. If a dog runs toward you while you are running, it’s possible said dog is a poorly trained goofball who simply wants to play. These dogs are often owned by people who call out “Don’t worry, he’s friendly!” or “He’s just saying hi, it’s okay!” If you are one of these dog owners, this is actually not okay! It is neither cute nor endearing. It’s against the law, inconsiderate of your neighbors, and dangerous for everyone, including your dog. Leash your dog, call a trainer, and don’t be that neighbor.The good news for runners is that this dog will probably not hurt you. If the dog’s body appears curvy, loose, or wiggly, he is not likely to be thinking of attacking you. The same holds true for an open-mouthed dog with a floppy tongue. If you are approached by one of these good-natured boneheads, stop running. Do not look at the dog or engage him in any way. This dog wants to play, so be boring. Chances are he will lose interest and leave you alone. You can also attempt to shake him by giving a firm command such as “No!” “Off!” or “Go home!”It is always surprising to me just how well this works! If the owner is nearby, this can also attract their attention, and (hopefully!) inspire them to retrieve their dog. My wife runs with a slip lead in her pocket. She’s had several encounters with well-meaning owners who simply lost control of their dogs. We’ve made some new friends in the neighborhood by returning these rascals to their grateful owners. Sometimes life happens, even for the most responsible pet parents. If you think you can do this safely, these leads are available in most pest stores and seldom cost more than a dollar.The dog who means businessWhile most dogs mean you no harm, there are others who mean business. They want you gone. For some, it is nothing personal. You are too close to their turf, and they have a problem with that. These dogs may stare intently, raise their hackles, show their teeth or make a lot of noise.They may hold perfectly still as they decide whether or not to give chase. For our purposes here, the difference between a defensive dog and an aggressive dog is neither here nor there. Both situations are potentially dangerous.Earlier, we discussed prey drive. Remember – prey runs. While it is quite possibly the most counterintuitive response imaginable, the best response to a charging dog is to stop running. Continuing to run can further trigger the dog’s prey drive and make them even more determined to take you down. It also increases your chances of falling, and if that happens, you are at even greater risk. So here is another piece of difficult advice: stay calm.Think back to the prey/predator analogy. When we act like prey we are treated like prey. Prey runs. Prey shrieks. Prey stares, transfixed with fear. Prey screams and flails around wildly. If the worst case scenario happens and you can think of nothing else, remember this – do not act like prey.Standing your ground or fighting backSome columnists have written that to avoid the resemblance of prey, runners should stand their ground and be ready to fight back. Kick! Punch! Growl! Yell! Make yourself big bad and scary so the dog backs off. Better yet, spray them with mace or pepper spray. They won’t seriously injure the dog, but will let him know you’re not an easy target, and that you mean business as well.This might work. But depending on why the dog is attacking, it might not. A dog who is protecting puppies or property sees you as a genuine threat, and may simply escalate the attack in response. Pepper spray requires close quarters to be effective – something we would ideally like to avoid. And if the canister malfunctions or the wind shifts its direction, the chemical is more likely to affect you than the dog. These sprays are painful enough to bring a grown man to his knees. And God help you if you fall to the ground in the presence a dangerous dog who is poised to attack.In my opinion, this option is simply too risky. 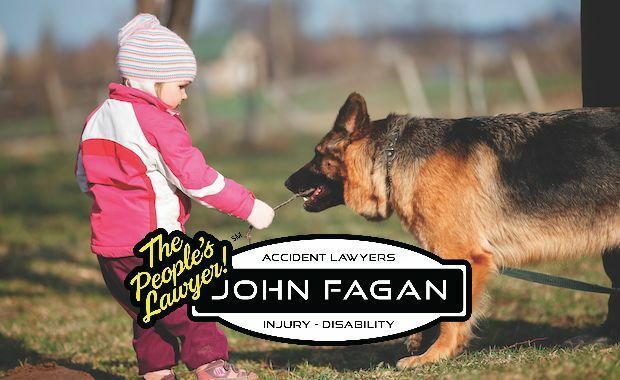 Unless you are very strong, and have extensive experience in handling dangerous dogs, this plan is not likely to lead to an injury-free encounter. I prefer plans which involve convincing the dog you are simply not worth the trouble.Fighting back without fighting backA dog who gives chase may be more interested in making you go away than picking a fight. He may see you as a threat or a challenge. Show him you are neither. Stop running and turn your body sideways. In this position, you can still see what the dog is doing, but you are not facing the dog in a way that could cause the dog to think you are rising to his challenge. Do not make direct eye contact.Many dogs see this as either a challenge or a threat, and can cause the situation to escalate quickly. If the dog backs off, hold your body in that position and WALK away, sideways, from the dog’s position. Avoid the direction from which the dog came. He wants you to go away. So without running, screaming, or making eye contact, let the dog know this is exactly what you are going to do.Using vocal commandsDogs who engage in this type of behavior often have few boundaries in their everyday lives. That said, most have them have at least some rudimentary training. Try issuing one of the vocal commands listed above – “No!” “Off!” “Sit!”, or my personal favorite, “Go home!” With the dog who means business, however, it is imperative to remember this is a command, not a request. Don’t scream or use a high pitched voice or growl through your teeth – remember, prey screams, challengers growl – but use a tone that lets the dog know you mean business too.Think of a drill sergeant. Bellow. Don’t ask. Command. Go home! That’s an order. You’d be surprised how many dogs – even aggressive ones – stop in their tracks, blink, and do exactly as they’re told! If you get this response, back off and retreat as discussed above. Again – do not run. Your Jedi mind trick may not work a second time.Using distractionsIt is sometimes possible to use a bait-and-switch technique to divert a charging dog. Some trainers recommend carrying a squeaky toy in your pocket. This dog obviously has a strong prey drive, which has already been triggered, so the theory is, runners can make it work in their favor.This technique advises squeaking the toy and waving it around (read, make the toy behave like a prey animal) and get the dog to fixate on the toy. Once the dog has done so, throw the toy as far as you can and while the dog is chasing the toy, make your retreat.While his can work in theory, it’s risky. If it doesn’t work, you’ve wasted precious seconds that could have been used to employ a more reliable technique. Think this through – how far can you throw? What if the dog retrieves the toy and brings it back? Now he thinks you’re his BFF, but have fun getting that toy back.Should this happen, do not attempt to retrieve the toy from the dog, even if he has dropped it on the ground. These types of dogs are dangerous and unpredictable. Lowering your center of gravity and getting to a dangerous dog’s eye level can provoke a mauling, or even a fatal attack.A better option is to give the dog something you may already have, and can easily reach. If you’re wearing a jacket, an extra layer, or a hat, take it off quickly and let the dog have it. He may decide he’s just as happy to thrash that as he is to thrash you. And while he is thrashing, make your retreat.The worst case scenarioA runner who has been brought to the ground by a dog, or worse yet two or more dogs, is in a life threatening situation. The American Veterinary Medical Associationteaches children in this scenario be pretend they are a rock. This is good advice for adults as well. Roll into a ball with your face toward the ground, and cover your head with your arms.Fighting back can enable the dog to grab an arm or leg, causing serious injury. It also exposes your face, neck and vital organs. Again, it seems counterintuitive, but your best hope for avoiding serious injury or death is to make yourself as uninteresting and non-threatening as possible. Such attacks are rare, but they do happen, and it’s imperative to have a survival plan.The best planThe best way for runners to survive encounters with dogs is to prevent them from happening in the first place. Plan your route ahead of time, and drive it before you run it. Do so at about the same time you plan to run, taking note of any off-leash dogs, ‘Beware Of Dog’ signs, or open gates. If you see potential trouble, consider changing your route. Ask your neighbors or other runners if there are any troublesome dogs in the vicinity. Get descriptions and locations and avoid those areas.When running, be aware of your surroundings. If you must use headphones, keep the volume low. If an aggressive dog is in the area, you will want to have as much time as possible to react.While I’m not a fan of mace or pepper spray, my wife’s deterrent of choice is a marine air horn. These small devices give off a jarring blast of sound most dogs have never encountered before. The volume alone is likely to jolt a dog’s sensitive hearing, and bring a fixated dog back to reality. Unlike mace or pepper spray, it is effective at a distance and carries no risk of being swept into the user’s face on a windy day. Additionally, it is not a sound a dog can easily mistake for sounds made by either predator or prey animals.When dogs cannot easily categorize another entity in this fashion, they usually err on the side of retreating. People who have used this technique (including my wife!) report the errant dogs skidding to a halt, blinking for a beat, then turning tail and running for home. This has always been her first choice of prevention, and has thankfully spared her from having to resort to more dangerous methods of self-defense.Like many other things in our world, the presence of aggressive dogs is something for which we must be prepared. That said, it is the product of the unique brand of human failure that is irresponsible dog ownership. If you see your dog in some of these scenarios, own the problem and call a trainer before your dog causes serious injury.Remember, the law is never on your side in these situations. If you’re a runner and you’ve encountered a dangerous dog, have a word with the owner. They may be unaware their dog is a danger to the community. Your efforts may not be appreciated at the time, but it is always better to take action before tragedy strikes as opposed to after.